Talamanca is the 3,000 square kilometer region of Costa Rica that stretches from the Caribbean ocean to country’s highest peaks in the Talamanca Cordillera. It is one of the most biologically and culturally diverse places on the planet. In 1984, when ANAI started the Talamanca Initiative, the conditions did not exist for a grassroots process to have started a landscape scale conservation and development initiative. There was little awareness of the need nor the opportunity. There were no competent organizations. Infrastructure and communications were very limited (there were only 6 telephones in the entire region). With isolation and only one high school, people had little opportunity to develop modern skills. There was little understanding of, and capacity to interact with, the outside world that was in the early stages of overwhelming the region. With its own analysis of the urgent need, ANAI saw the opportunity to begin a process to begin addressing the region’s social, economic and environmental challenges. The first regional action was the community nursery program. Based on its earlier work introducing and evaluating more than 200 species of potential new crops, ANAI facilitated a process in which each of the region’s 35 rural communities started an informal collective action group to manage a cacao, fruit and wood tree nursery that provided “free” seedlings to all who worked, in proportion to their participation. With clear objectives in diversification of the family farm systems, agricultural and sustainability training, and developing community organization capacities, ANAI worked together with each community group once a week for three years. The nurseries not only produced over 2 million seedlings, they became the foundation for future actions. As the nurseries matured, a landscape level planning process was carried out by the representatives of the 35 communities who met once a month over two years, allowing for a rich and productive experience with active participation of the region’s men, women and youth, from all of its cultures. These “Sunday meetings” developed a diversity of farm, community and landscape level objectives and projects to address human wellbeing, organization, livelihood sustainability, social and cultural sustainability, biodiversity sustainability, environmental management, connectivity, collective action and empowerment. Building on the experiences and mutual trust developed during three years of working together in the nurseries, people from the communities committed to voluntarily working and participating to put this program into practice. It was agreed that each initiative would be owned by its participants, and that participation would be open to all. ANAI committed to look for funding, manage the initial stages of the endeavors, and guide the capacity building process for local participants to learn to manage them themselves, through experience. It’s not really possible to briefly capture the diversity of subsequent efforts. The following is an extreme shorthand version of some of the objectives, activities, challenges, organizations created and contributions made. Strategic objective: Create a sustainable regional level association to market products, continue diversification, support sustainable agriculture, provide mutual support and be a voice. APPTA (Asociación de Pequeños Productores de Talamanca / Talamanca Small Farmers Association) was created during the final “Sunday meeting”, and has matured into one of the world’s largest organic small farmer cooperatives. APPTA buys, processes and exports organic, Fair Trade cacao, bananas and other tropical fruits, promotes diverse sustainable agriculture, and provides the region with a diversity of other services. Reflecting the broad participation promoted in the Talamanca Initiative, 90% of APPTA’s 1,000 members are indigenous and 33% are women. Their directive board normally has a majority of women. Strategic objective: Create a sustainable regional level association to support initiatives for biodiversity protection, environmental management, training and mutual support for conservation and sustainable livelihoods. 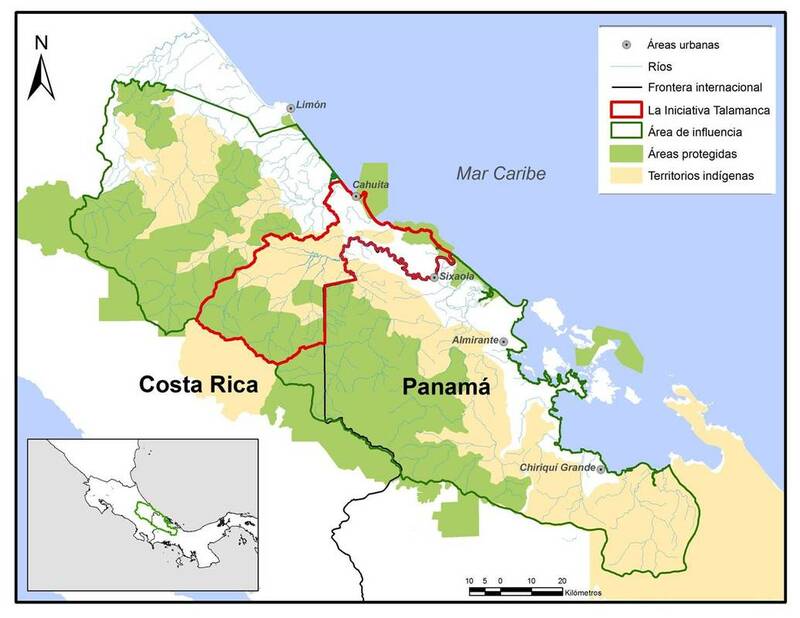 The CBTC (Corredor Biológico Talamanca-Caribe / The Talamanca-Caribbean Biological Corridor) process was begun in 1990. Like APPTA, it continues today to be a viable, relevant grassroots organization more than 25 years after its creation. CBTC is a conservation alliance of local organizations centered on the extraordinary forested landscape that stretches from the Talamanca mountain range to the Caribbean sea. CBTC works to protect this land (much of which is privately or collectively owned) through biodiversity-friendly productive activities, conservation measures, environmental services, environmental education and management of the Talamanca land trust. CBTC is a unique forum for local organizations to be informed, to debate and analyze important local and regional issues, and to make collaborative decisions to address these issues. Strategic objective: Create an indigenous owned and managed training center. The indigenous Talamanca Training Center known as the Educational Farm was established in 1991 near the border between the Bri Bri and Cabecar Indigenous Territories. It quickly became the home for training local people in topics ranging from agro-ecological farming systems, animal husbandry, high school equivalency, computer literacy and community development. An example of its hands on learning approach was its construction, which was capitalized to train young men and women as carpenters, electricians, plumbers and other trades people, who have served their growing communities as builders and project developers. It continues its mission today as a meeting place for local organizations and a venue for training activities, a high school equivalency program, and university degree programs in education, biology, management and public health. Training and support were provided to the community groups interested in eco and cultural tourism as a way to bring together sustainable economic development, nature conservation and cultural strengthening, resulting in the formation of community lodges, guide groups, and service providers across the Talamanca landscape. Stibrawpa, the Indigenous Women’s Group of Yorkin, and Wak Ka Koneke in the Kekoldi Indigenous Territory are examples of communities that were supported to build and manage lodges, provide nature and cultural interpretation programs for visitors, and support community development. The economic, social and environmental wellbeing they have generated illustrates the importance of getting the benefits of ecotourism to those who live with and care for nature in communities far from the nearest road. The local organizations working with tourism were encouraged to get together to form the Talamancan Community Ecotourism Network, a collaborative effort that facilitated information sharing, training, product development and co-marketing. This regional mutual support network was the major inspiration and pillar for the formation of ACTUAR, the national level community tourism and conservation association. Strategic objective: Provide a diversity of learning opportunities in a way that facilitates participation by women, men and youth from all the communities of the landscape, no matter how isolated. Over the years, a large number and diversity of training programs helped people share and acquire new knowledge and skills in sustainable organic agriculture, crop processing, building and managing ecotourism lodges, guiding, small business management, credit / banking, strategic planning, construction, animal husbandry, fish culture, reforestation, environmental management, and leadership. While the methodologies used were as diverse as the topics, there is a strong focus on experiential learning.